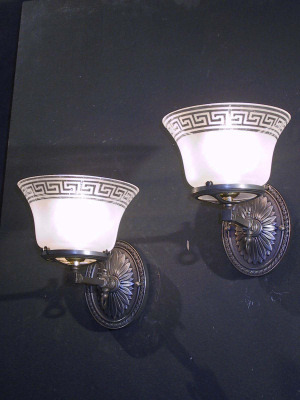 Circa 1905, these very nice Gas Sconces with flat looped gas keys have an oblong back plate with sunburst design. The Transfer Acid Etched Greek Key Gas Shades are a nice touch. 8" length x 7 1/4" width x 11 1/4" from wall.